Louisville, Ky. (July 30, 2015)—Over 100 sales, marketing and product management employees from GE Appliances were present at a volunteer day held on July 10 at Louisville’s Boys & Girls Haven. Boys & Girls Haven is a private, nonprofit agency dedicated to serving victims of abuse and neglect since 1950. For their volunteer day, the GE Appliances team renovated sections of the older buildings on the primary campus, which include the residential houses, the on-campus school, and the equine center. Projects ranging from applying fresh coats of paint and cleaning up the landscaping, to rebuilding access ramps and adding new appliances to the residential kitchen were divided among the large group. 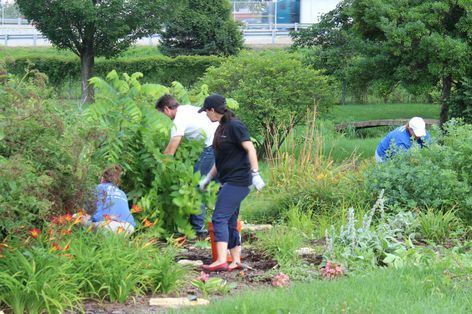 Over 100 sales, marketing and product management employees from GE Appliances were present at a volunteer day held on July 10 at Louisville’s Boys & Girls Haven. Our Mission Statement: We shelter, heal and teach struggling young people to become productive and healthy members of our community. Boy & Girls Haven is a private nonprofit agency, nationally accredited by the Council on Accreditation (COA) and dedicated to serving victims of abuse, abandonment, and/or neglect. We serve clients from across Kentucky through the main campus in the Louisville metropolitan area and several satellite offices around the state. While our services have expanded over the years, the goal since our beginning has been to provide every child we serve with a home, a family, a community, and a future. Since 1950, Boys & Girls Haven has touched the lives of more than 5,000 vulnerable and forgotten children.